One of my favorite things about the Holiday season is all the yummy sweet treats. There are special cookies, cakes and desserts we tend to only make this time of the year. 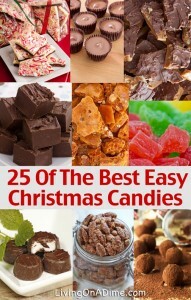 Today I’d like to share 25 Christmas Candy recipes with you from the Dining on a Dime cookbook. Grease 2 jelly roll pans. In a saucepan, add corn syrup, sugar, and water. Bring to a boil and cook to a hard ball stage, 260 degrees. Add peanuts and cook to hard crack at 290 degrees. Add baking soda and salt. Stir well. Pour into pans and spread thin. Cool quickly. I usually make this for Christmas and I don’t have room left in my refrigerator so I just set it outside in the snow for a few minutes until it has cooled. Makes 3-4 dozen pieces. 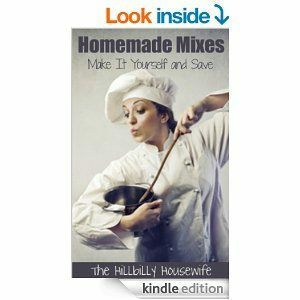 Mix the powdered sugar, egg white or meringue, butter and peppermint flavoring. Make into small balls about the size of a quarter and then flatten on a cookie sheet. Put in the freezer. Melt the chocolate over a double boiler. When the chocolate is melted, take the mints out of the freezer. Put a toothpick through the center of a mint and dip into the chocolate. If the mints on the cookie sheet begin to soften and thaw, refreeze because they are easier to dip when they are frozen. Put the dipped mints back on the cookie sheet and let the chocolate harden in the freezer. Wrap each mint in a piece of 5×5 inch foil. Makes twenty 2-inch mints. Cream the butter. Add the peanut butter, powdered sugar and vanilla. Place the chocolate in a microwave safe dish and melt. Microwave until melted, stirring frequently. Pour a small amount of melted chocolate in the bottom of paper holders. Place the filling inside and then pour more chocolate on top until the filling is covered. Let the chocolate harden before serving. Makes 2 dozen. *When this homemade peanut butter cups recipe was originally written, you couldn’t buy dipping chocolate or the wafers. If you prefer, you can use something like that in place of the chocolate chips and paraffin. Shape peanut butter into small 1 1/2 inch balls. Dip the peanut butter balls into chocolate and place on wax paper to harden. Mix ingredients. Then boil 5 minutes. Beat until well blended. Pour into 2 greased 9×13 pans for thicker pieces and add another 8×8 pan for thinner pieces. Butter an 8×8 inch pan. Spread the nuts in the bottom of the pan. On medium heat, bring the sugar and butter to a boil and boil 7 minutes. Spread into the pan. Sprinkle the chocolate chips on top. Let it sit a few minutes. When melted, spread evenly. Let cool before cracking into pieces. Makes 24 pieces. Place marshmallows on a pan that is covered with wax paper and place in the freezer. They will be ready by the time you need to dip them. Pour coconut, sprinkles and nuts on squares of wax paper. You could use a bowl but wax paper saves time and effort in clean up. Melt the chocolate chips in the microwave for a couple of minutes, stirring every 30 seconds, until melted. Place frozen marshmallows on a skewer or toothpick and dip in chocolate. Then in roll in your choice of ingredients (below). Use a fork to slide them back on the wax paper. Chill. Once chilled, you can package in clear cellophane bags. Cut the peel on each fruit into quarters. Pull the peel off in these quarter sections. Slice peel into 1/4 inch-wide strips. In a saucepan add salt and cover with cold water. Boil 15 minutes, pour off water and add fresh water. Boil 20 minutes. Change water again and boil another 20 minutes. Drain and cover with 2 1/2 cups sugar and 1 cup water. Simmer, stirring constantly, until all the syrup has boiled away. Do not let the peels scorch. Spread on wax paper. Roll peels in the remaining sugar. Let dry. Store in an airtight container. These will keep one week or can be frozen. *If non-organic fruit is used, wash the peels thoroughly before peeling. In a small bowl, beat the egg white with the water. Stir in nuts, mixing until well blended. In a another small bowl, mix together sugar, salt, cinnamon, cloves and nutmeg. Sprinkle over the moistened nuts. Spread nuts on a pan lined with foil or silpat. Bake at 350 degrees for 30 minutes, stirring once or twice. Do not burn the nuts. Melt the almond bark in the microwave according to the directions. Stir in peppermints and flavoring. I like my bark really minty so I add more flavoring. Pour onto waxed paper or silpat on a cookie sheet and let harden. You can put it in the fridge if you prefer. Then break into pieces. *To crush candy canes, put them in a ziptop bag and smash them with a rolling pin. Variations: You can put just about anything into almond bark for different flavors! Combine sugar, corn syrup, evaporated milk, butter and salt in a saucepan. Heat gradually to boiling, stirring constantly. Boil until golden brown, 7-10 minutes (240 degrees). Add vanilla and nuts. Pour into a well buttered 8 inch pan. Cool several hours or overnight. Cut into small squares. Dip in chocolate if desired. Makes 64 pieces. Heat oven to 300 degrees. Cover a baking sheet with foil, shiny side up, and grease. For each candy, place 3 pecan halves into a “Y” shape on the foil. Place 1 caramel on the center of each “Y”. Bake just until the candy is melted. If they looked deformed after baking, reshape while the caramel is warm. Heat chocolate over low heat, stirring constantly, just until melted. Spoon mixture over candies, leaving the ends uncovered. Refrigerate until firm (about 30 minutes). Makes about 24 turtles. Combine applesauce and sugar in a saucepan. Bring to a boil and cook 2 minutes. Dissolve the gelatin in the applesauce mixture. Pour into an 8×8 inch pan. After 24 hours, cut into 1 inch squares and roll in sugar. Roll in the sugar a second time 24 hours later. Makes 64 pieces. Pour both ingredients into a microwave proof bowl. Melt in 30 second increments. Stir after each 30 seconds. When melted, pour into a greased 8×8 inch pan. Let cool in the fridge and then cut into pieces. Cherry Mash: Use cherry chips to make to the fudge. Then pour melted chocolate chips on top with peanuts. Peanut Butter: Use peanut butter chips to make to the fudge. Then top with chocolate or don’t, if you prefer not to. Cover and chill 1 hour or until mixture is completely cool, stirring often. Drop mixture from a rounded teaspoon onto a baking sheet lined with waxed paper. Chill 30 minutes or until firm. Roll balls into nuts or unsweetened cocoa powder. Store in a cool, dry location. Makes 15-20 pieces. *You may roll truffles in coconut, sprinkles, powdered sugar or dip in melted white, dark or milk chocolate. Melt chocolate. Add desired amount of coconut. Place by spoonfuls on waxed paper or silpat on a cookie sheet. Place in the fridge to harden. Mix coconut, sweetened condensed milk, powdered sugar and vanilla until well blended. Drop by spoonfuls onto waxed paper or silpat. Place 1 almond in the center of each ball and reform coconut mixture around the ball. You can use extra coconut to make it stiffer. Place in the freezer to set up for 15 minutes. When set (they won’t be hard), dip in the melted chocolate. Place back on waxed paper and let harden in the fridge.